No museum of art history is complete without a sinister sarcophagus or two from the time of the pharaohs. And, true to form, galleries 1 to 9 in the Kunsthistorisches Museum cover ancient Egypt from around 4,000 BC to the early Christian era. Relief of Nebhepetre Mentuhotep II and the Goddess Hathor,ca. 2010–2000 B.C. The Egyptian collection is an immersive experience, with the walls, ceilings and even door arches of several rooms matching the topic in terms of design and decoration. Even without understanding anything, a brief wander through the displays gives you an insight into the oppressive obsessions of the time – <cough> the afterlife <cough>. There’s also something strangely reassuring about seeing all those symbols, shapes and objects we’re so familiar with from popular books and films. Regal-looking man with a long, narrow beard? Yep. General feeling there must be a lot of very empty archaeological dig sites in Egypt? Yep. Already in Gallery 1 you’re confronted by mummies, sarcophagi, scarabs, coffins and those canopic jars where the internal organs were stored for the afterlife. The giant sarcophagus of Pa-di-pep from the late-period 26th dynasty is particularly impressive. Incidentally, the gallery’s main columns aren’t cunningly aged to look weathered by centuries of Egyptian sun – they are originals from excavations in Alexandria. Gallery 2 takes you “inside” (literally) a mastaba or large tomb. You can go into the actual cult chamber, which was shipped over from its location in Giza in 1914. Ka-ni-nisut, the original occupant of the tomb, was a high-ranking state official from around the 4th/5th dynasty, some 4,500 years ago. Gallery 3 has a collection of Shabti, which look a little like miniature Oscars, but were left in tombs to take on manual tasks for the deceased in the afterlife. Leaving nothing to chance, they sometimes also included model overseers to manage the labourers. You’ve enough problems in the afterlife without having to worry about rebellious workers. Gallery 5 is dedicated to funerary literature – the scrolls, wall inscriptions and similar containing the spells and texts required to ensure safe passage into the afterlife. After you go in, look to the left for an original papyrus showing a pictorial guide to the underworld. Gallery 4 leads off 5 and covers magic and gods (another big deal in ancient Egypt). If you want an illicit snigger here, check out the display cabinet on your right as you enter. There’s a “protective figure” of a man with a certain portion of his anatomy accentuated to twice his body size. Check also the central display for various mummified animals, including a cat, crocodile, fish and snake. 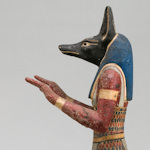 There’s even a tiny coffin built for a shrew, a divine animal representing the sky god Horus. Which might have led to some teasing from his arch-enemy Set, if Horus wasn’t more usually associated with the falcon. Gallery 6 shows that ancient Egypt had more to offer than just worrying about the afterlife and keeping the gods happy, with displays of clothes, pottery and jewelry from the time. The collection ends with galleries 7 to 9 and various busts, statues, temple items and similar. In 7, for example, you’ll find false doors that acted as symbolic gateways between the present and the hereafter. Be sure to find the unusually lifelike statue of Sebek-em-saf from 1700 BC. “Lifelike” because he was a chubby fellow and the statue shows it. Clearly a man of wealth and appetite. In 9, look for the 2nd century BC sarcophagus of Pa-nehem-isis, a priest. Almost every surface is inscribed with symbols. It seems it was unfinished and I have visions of Egyptian stonecutters hammering away desperately, trying to get done on deadline. Each time I visit, more and more English appears in the information posters and item labels. But some galleries are largely German-only. So if you want more than just impressions as you pass through, consider some form of guide (audio or otherwise).